These have got to be the cutest most random plush toys I have ever seen. Meet the Bananya's! Part cat part banana or just cats hanging out in banana's who can say, all I know is they were just too darn adorable to pass up. For myself I got the adorable Kiddy whose not only extra fluffy but pink and wearing a bow. 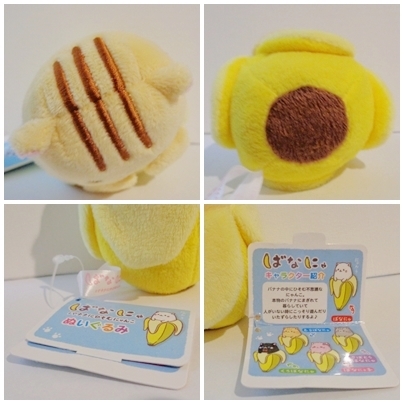 Very high quality plush, soft, squishy, with a bean filled banana. 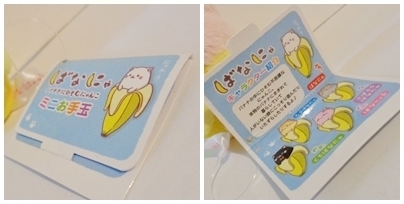 The tag is also cute and unique as it opens up to display the various banana cats you can get. 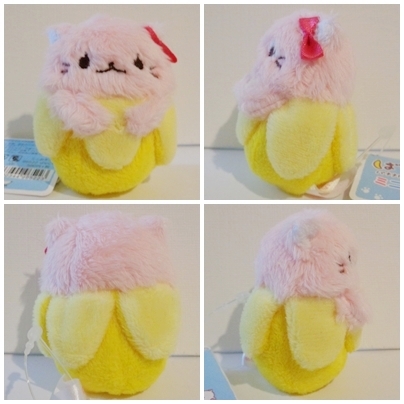 One thing that did disappoint me however was her size, on the Otaku Mode page they had an image of hand holding her and the other 'Bananya juggling ball's' and they looked only a tad smaller than the other listing of 'Banyana plushies', perhaps there was a photo mix up or something. She is just over 5cm tall so she is positively miniscule, like a plush toy for a plush toy! 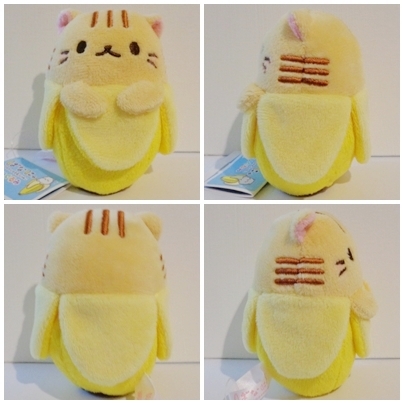 I did end up ordering one of the 'Bananya plushies' called Tiger and he is a gift for my friend, as you can see from the above picture he's much bigger standing about 9cm high. He is also of a high quality, very soft, with beans in the bottom of his banana. As he is larger he also has a proper banana bottom. His tag is exactly the same and that's really all their is to him. Because of my disappointment in the size of my Kiddy and also because they are just so damn adorable I maybe purchasing more of these, a larger Kiddy for myself and maybe a mini Tabby for another friend. What do you think, totally cute or totally weird?